Sprinkle pork chops with seasoned salt. In a skillet brown chops on both sides in oil. 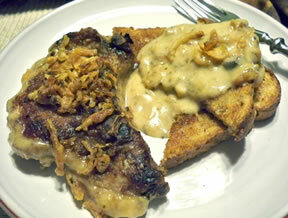 In a large bowl, combine the soup, sour cream, milk, salt & pepper; stir in hash browns, 3/4 C. cheese & half of the onions. 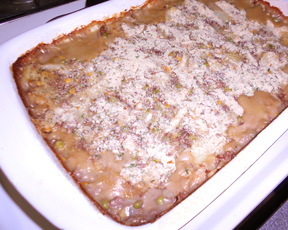 Spread into a greased 13 x 9 baking dish. Arrange pork chops on top. Cover & bake at 350° for 40 min. Uncover. Sprinkle with remaining cheese & onions. 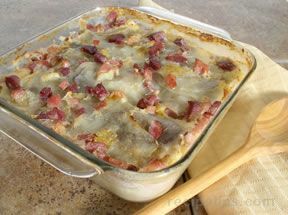 Bake uncovered 5-10 minutes linger or until potatoes are tender, cheese is melted & meat juices run clear.